No. 16 UCSD baseball had quite the busy weekend, playing six home games over the course of a four-day period. It finished the weekend 5-1, taking only one loss during its doubleheader with Cal State San Bernardino on Saturday night, which snapped the Tritons’ six-game winning streak. The Tritons are currently 7-1 on the season. Freshman right-handed pitcher Kyle Mora got his first collegiate start Thursday night against UT Permian Basin. Mora went four innings, holding the UTPB Falcons to three hits and three runs. The Falcons scored first in the top of the third, getting two runs off Mora. After senior outfielder Gradeigh Sanchez’s single up the middle, junior outfielder Jack Larsen homered to right field, tying the game up at 2–2 headed into the top of the fourth. UTPB hit a solo home run off Mora, taking the lead 3–2 before the Tritons answered back scoring another run, tying the game back up yet again. Sophomore left-handed pitcher Travis Roberts came in to pitch for the Tritons in the top of the fifth. Roberts gave up two back-to-back two-out singles, putting runners on first and second. The Falcons hit a bases-clearing double as they regained the lead over the Tritons 5–3, and the Tritons responded with a two-run homer from sophomore infielder Tyler Plantier. UTPB scraped together one run off of freshman right-handed pitcher Tim Nelson in the seventh before Tritons’ junior outfielder Jack Larsen hit his second solo-bomb of the day to right field, tying the game up at 6–6. Freshman right-handed pitcher Erik Amundson held the Falcons at six runs as he retired the side in the top of the eighth. Junior infielder JD Hearn singled in junior infielder Vince Mori from third base in the bottom of the eighth, taking a one-run lead for the Tritons. Freshman right-handed pitcher Cameron Kurz got the save for the Tritons as he came in the game for the top of the ninth and retired the side. Freshman left-handed pitcher Brent Bell earned his first collegiate start and win during game two against UTPB on Friday. He went five scoreless innings before freshman right-handed pitcher Jonah Dipoto came in the game and threw a perfect three innings, retiring all nine batters in order. The Tritons won 8–1 against UT Permian Basin in game two of the three-game series with the Falcons. Vince Mori went 3–4 and had three RBIS for the Tritons while junior outfielder Brandon Shirley had two RBIS off his two-run triple in the bottom of the eighth inning. In addition, Larsen and Plantier both had an RBI for the Tritons. Senior right-handed pitcher, Alon Leichman went the distance as he threw his first complete game as a Triton on Friday night, earning the win as he helped UCSD complete the three-game sweep against UTPB. Leichman gave up two earned runs with six hits against the Falcons. After a Sanchez single in the bottom of the first inning, junior outfielder Christian Leung hit a two-out base hit to center field, giving the Tritons the lead, 1–0. The Tritons scored four runs in the second inning with two-outs, their rally beginning with a throwing error from the Falcon’s third baseman. Sanchez doubled down the left-field line, scoring one run while Larsen followed him with a triple down the right-field line, scoring two more for the Tritons. Plantier singled to left field, scoring Larsen from third before Plantier was thrown out trying to advance to second ending the inning and enabling the Tritons to lead 5–0 heading into the top of the third. While the Tritons were shut out by the Falcons for the rest of the game, Leichman didn’t allow the Falcons to put a run on the board until the top of the sixth. The Falcons rallied, scoring two more runs in the top of the seventh. But Leichman got out of it, securing the win for the Tritons, 5–3. The Tritons faced off with Cal State University San Bernardino for a non-conference doubleheader on Saturday. The Tritons lost game one to the Coyotes, 8–2 but came back and won game two, 9–1. Nelson took the Tritons’ first loss of the season as he came relieving the starting pitcher, sophomore right-handed pitcher Jack Rupe, in the middle of the fourth inning. 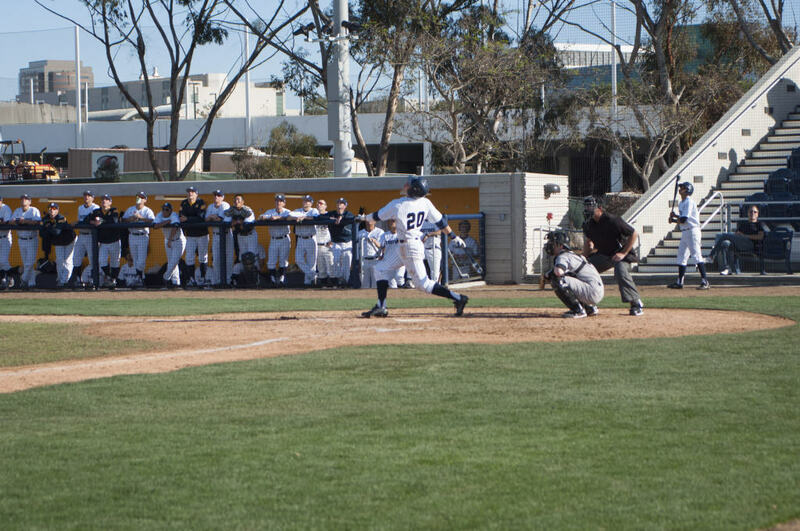 Plantier produced all of UCSD’s runs in the first game as he went three for four with two singles and two RBIS. CSUSB scored one run in the third through seventh innings, until it broke it open in the top of the eight with a three-run inning. The Coyotes handed UCSD its first loss of the season with a final score of 8–2. Freshman right-handed pitcher Kyle Lucke got his first collegiate start for the Tritons during the nightcap of the doubleheader against CSUSB. Lucke went five innings, holding the Coyotes to only one run and one hit, which he gave up during the top of the first inning, totalling five strikeouts that night. The Tritons scored their first run of the night in the bottom of the third by Leung’s sacrifice fly with the bases loaded; UCSD broke it open in the bottom of the fourth with a leadoff base hit from junior outfielder Brandon Shirley, a walk from junior infielder Tyler Howsley and then a double to right center by sophomore infielder Tim White, scoring Shirley. Larsen followed with a three-run bomb to right field, taking the lead 5–1. In the fifth, the Tritons took advantage of walks and a couple throwing errors, allowing them to put up four more runs. Roberts came in for relief for Lucke in the top of the sixth, allowing no hits and no runs to score. Left-handed freshman Preston Mott earned the start on the mound for the Tritons as they faced off with No. 10 Cal Poly Pomona on Sunday. Mott went five innings, holding CPP to four hits and no runs. Freshman right-handed pitcher Jonah Dipoto came in relief for Mott, earning the win for the Tritons as he threw two innings, striking out three and giving up one hit and one run. The Tritons struck first on a lead off double by Plantier in the bottom of the second; freshman first-baseman Tyler Durna singled up the middle, scoring Plantier. Dipoto gave up a solo-shot to right field in the sixth, tying the game back up at 1–1. The Tritons battled and took advantage of two errors by the CPP Broncos, as they scored three more runs in the bottom of the sixth. Mora entered the game for Dipoto in the eighth, giving up one hit and allowing a run to score on an error. The Tritons added two more insurance runs in the bottom of the eighth before freshman right-handed pitcher Cameron Kurz came in and shut CPP down for the win in the ninth. The Tritons will be back in action Friday, Feb. 19 at Triton Ballpark with another nonconference series against Concordia Irvine. First pitch is set for 6 p.m.